Chatsworth House and Park is one of Derbyshire’s most iconic buildings, with its yellow stone and surrounding gardens it is hard for it not to take your breath away. Sir William Cavendish and his wife first lived in the original house in the mid-16th century. After his passing many Dukes resided in Chatsworth house, with all constructing some architect or enriching the gardens. The house and gardens have remained little changed since this, the only change being the demolition of the great conservatory for a maze in replacement. Chatsworth House has seen many famous people who come and stay and find the house and gardens magnificent. The surrounding park is an open space that is filled with greenery and woods that show the best possible views of the house. It is an excellent place for families to go on walks before visiting the farmyard that is behind the house. They have milking demonstrations and many other insights in to life on a farm. You can finish off having a warm drink whilst the children play on the Adventure playground. Chatsworth House makes the most out of every occasion and this Easter is no different, From the 19th March to 10th April your children can take part in an Easter egg trail and hunt for all the decorated eggs, make sure you keep an eye out for the Easter Bunny…. Your children can search for golden eggs in the park and see all that spring has to offer before finally having their face painted and seeing all the newly hatched chicks and meeting all the baby lambs that have just been born in the farm yard. Why not make this Easter the most memorable of all by staying at Endmoor Farm over the Easter Holidays. 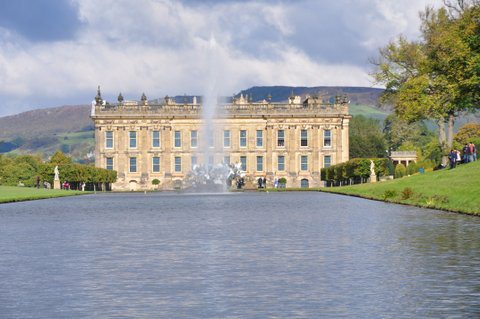 We have 6 cottages that are only a 20 minute drive from Chatsworth House. There are 6 cottages some of which can sleep up to 8 so why not bring your friends and make this a holiday to remember. There is so much more fun to be had in Derbyshire this Easter, find out more about all our cottages and start planning your Easter trip.